September 22, 2016 July 1, 2017 asepptr Traveler Tips To Bandung West Java Indonesia. 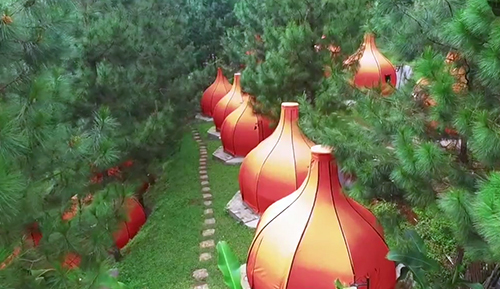 In the area of north Bandung there is a travel destinations The Lodge Earthbound Adventure Park. The location of this mountain tourism Bandung, located at Cibodas Village, at an altitude of between 1,312 to 2,080 meters above sea level. Highest point on the summit of Mount Tangkuban Perahu. As the area is located in the mountains, the average temperature ranges between 17 ° -27 ° C. This area is also known as, one of the producers of vegetables. Lovely place with the green pine trees and visitors can breathe fresh air away from the pollution. The Lodge Cibodas Maribaya Lembang, Bandung, has a land area of 3 hectares in the foothills Maribaya surrounded by the natural pine forests and also downstream of the Cibodas. The character of the place is very cool and comfortable for your vacation. The scenery is beautiful and expansive recreation is a pity if you missed it. For tourists who like the outdoors, this place is highly recommended to visit. Its location is very photogenic in Lembang district, and this great forest juanda make these places very pity to miss. The location is near Maribaya, this place is pretty recommended for those of you who love taking photos, because the tickets are very cheap for the size of the natural attractions in Bandung. The Lodge there are many spots of contemporary photo and rely views of pine trees. Almost all spot leads to a pine forest. This place has now become the most visited tourist destination as a refreshing, while photographing the beauty of the landscape of the mountains. You can take pictures in elevation with a view of green trees. Here, too, there is the flow of a river is typical of the mountains, clear naturally. If you want to enjoy all the natural beauty provided by this place, you only need to pay the ticket fee of 15,000 rupiah / person. While tickets for photos, at home tree, you will only be charged 10,000 rupiah / person. The Lodge is located approximately 5 km from the attractions Waterfall Maribaya, Lembang. which offers plenty of natural charm that can not be missed. To go to this place can take the path of Dago- Terminal Dago Giri – Maribaya, then to Cibodas. If from the road Setiabudhi (Ledeng) towards Lembang – Jln. Maribaya – waterfall Maribaya – Cibodas. Jl. East Maribaya Km. 6 Kampung Kosambi, Cibodas Village, Lembang, West Bandung regency. – For those using a private car, to the location, we suggest not pass Dago, because the streets are narrow, many slopes, and ravines. We were advised to pass Punclut (Ciumbuleuit) is then out at market lembang, you do not need to rotate past the Floating Market / Hotel Grand Lembang, you can simply cut off the road to the right past the alley houses (in the car). Thank you for some other informative site. Where else could I get that type of info written in such an ideal means? I’ve a undertaking that I’m just now working on, and I’ve been on the glance out for such info. I’ve visited your site too, very informative. Keep up the spirit of writing and learning.